Extra Heavy Duty Architectural Commercial Shadecloth is made specifically for Large Tensioned Shade Sails and Tension Structures in commercial applications such as shopping centres carparks, etc. Architec 400 is a 400gsm High Density Polyethylene (HDPE) fabric with is extremely strong and resistant to tearing. The fabric incorporates the latest in Ultra Violet (UV) stabilizers and comes with a 15 year UV warranty, the best in the industry. These new UV stabilisers also provide improved colour consistency and colourfastness. Architec 400 contains no flat tape. It is made from a combination of monofilament yarn and our proprietary Ovalon monofilament yarn. Ovalon provides high strength and minimal stretch in both the Weft and Warp direction of the stitch pattern, maintaining tension. It also offers over 90% UV protection. 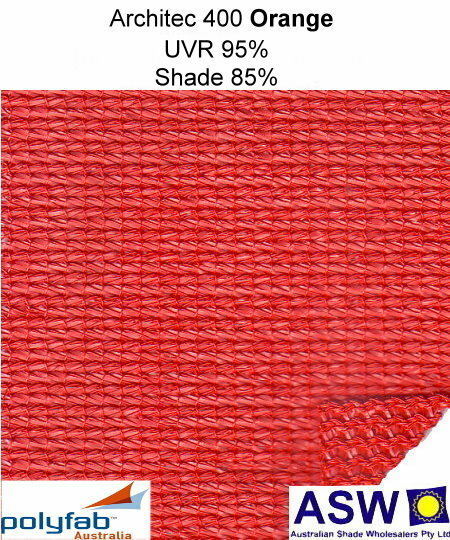 With Ovalon you get the strength of monofilament yarns combined with the UV protection of tape.